Capturing signatures electronically has never been easier. With INUVIO’s ScanSign 3.0 electronic signature capture solution, you’ll save time, money and a little of your sanity by capturing signatures and data electronically. 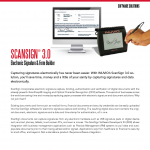 ScanSign incorporates electronic signature capture, binding, authentication and verification of digital documents with the already powerful ScanSharp® imaging and Optical Character Recognition (OCR) software. Thousands of businesses across the world are saving time and money by replacing paper processes with electronic signature and document solutions. Why not join them? Existing documents and forms such as medical forms, financial documents and security credentials can be easily uploaded into the ScanSign software for electronic signature capture and binding. The resulting digital document contains the original document, electronic signature and a date and time stamp for authentication, all in one. ScanSign documents can capture signatures from any electronic hardware such as USB signature pads or digital device such as smart phones, tablets, touch-screen PCs, and even a mouse. The ScanSign Software Developer’s Kit (SDK) allows integration with business management applications such as Practice Management (PM) systems to pull data and autopopulate documents prior to them being edited and/or signed. Applications vary from healthcare to financial to security to small office, and beyond. Not a standalone product. Requires software integration. > EFFICIENT – Quickly and easily capture, bind and authenticate electronic signatures into your existing PDF documents and forms. > ACCURATE – Capture “check the box”, “fill in the blank” and “auto-populate” fields along with electronic signatures in stored PDF documents and forms. > NETWORKABLE – Combine with ScanGlobal® for IP / LAN / WAN networking and remote server storage of resulting electronic PDF capture documents. > COMPATIBLE – Hundreds of third-party hardware options ranging from USB signature to touch-screen computers to tablets to smart phones. > SUPPORT – Industry leading two year unlimited warranty and support. > WARRANTY – Exclusive, inductry-leading 24-month warranty, maintenance and support. > SUPPORT – Annual support includes unlimited technical support, license transfers and software updates. TM & Copyright © 2012-13 INUVIO, Inc. and Innovative Card Scanning, Inc. All Rights Reserved.